Want your locker room, team meeting room, or court side chairs to be the same chairs used by the pros or major college teams? Look no further than the quality logo chairs at Athletic Seating. We offer the full line of Clarin chairs, that are the #1 choice of team logo seating. That includes a wide variety of seating choices…from Logo Stools, with 3 different height sizes, all the way up to the top of the line, plush VIP Chairs….and everything in between! Plus, all products are made right here in the USA ! No waiting up to 12 weeks to get your chairs like the “others” than are made overseas. 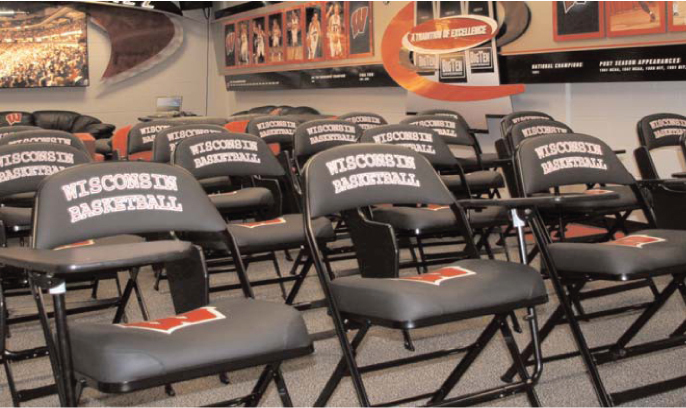 Athletic Seating will not be undersold….we are the only dealer with in house graphics department and logo printing, which keeps the cost down to you, the customer. And with our exclusive printing process, which makes your teams logos and colors “jump” off the chair, you’ll be glad you chose us. Ask us for a sample print of our process, then ask any other dealer for a sample of theirs….the difference is day and night. Thats if they can even offer a sample. We would like to thank all of our customers for their trust in us over this past year, and wish all a happy holiday season.